This Cashiers NC home for sale, 58 Wild Creek Road, is a gem. The 3 bed, 3.5 bath home is situated on a lot that is 5.27 acres in size. High end construction and a stunning setting offers great privacy and serenity. As a result this property a must-see. If you have been waiting for the right home look no further. Ultimately this is an ideal mountain getaway! 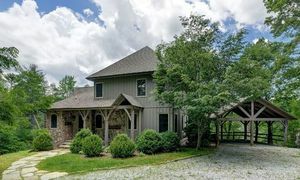 58 Wild Creek Road is in an ideal location, offering easy access to both Highlands and Cashiers. The beautiful home boasts cathedral ceilings with rich wood beams and a wall of windows in the great room. Additionally a stately stone fireplace and attached wet bar complete round out the room. The kitchen opens to the dining area, therefore allowing the chef to be involved in all conversation. In addition, you will find everything you need to cook or entertain. Stainless steel appliances, granite counter tops, custom cabinets, two sinks, and a large island with a built in wine rack and plenty of storage make the kitchen a space for an avid cook. The kitchen was designed for entertaining. This fabulous Cashiers NC property is one to be enjoyed. There are multiple porches and decks enabling easy access to views and fresh mountain air. Most noteworthy is the large screened-in porch, overlooking a babbling stream. In addition, there is a beautiful fireplace and plenty of space for large couches, dining table, and more. Consequently this is a favorite spot for all! 58 Wild Creek Road is move-in ready! Contact our team at Berkshire Hathaway HomeServices Meadows Mountain Realty today to learn more about Cashiers NC real estate. We welcome the opportunity to set up a private showing for 58 Wild Creek Road or any other property on your list. Let our knowledge and experience serve as your guide to locating the ideal Cashiers NC home for sale for you and your family.